San Diego’s gorgeous landscape and beautiful weather make it an optimal place to go on a bike ride. However, dangers are present for cyclists throughout the city. From busy freeway areas to dangerous intersections, cyclists can suffer serious injuries in collisions with motor vehicles in the city. To avoid these incidents, stick to the safe scenic places to ride your bike in San Diego – and avoid the dangerous, risky spots. The beautiful Pacific Beach Boardwalk is an ideal spot for taking a bike ride on a sunny day. Although the area tends to get a bit crowded with tourists and other San Diego residents, safe riding techniques can help you navigate the boardwalk without incident. The boardwalk is also free from motorists, limiting your injury risk significantly. In addition, the boardwalk has no shortage of activities – from people watching to restaurants and coffee shops and more, there is never a dull moment. This tricky spot can be quite perilous to cyclists. The Nimitz Boulevard near the Sunset Cliffs is located on the West End of Interstate 8, a busy freeway intersection that is a spot for numerous collisions over the years. The bike lane ends right where motorists are attempting to merge onto the 8, making it nearly impossible for cyclists to change lanes and continue straight. It is very tricky to maneuver, especially with aggressive drivers attempting to get on the freeway. It’s definitely do-able but you do raise your chances of getting into a bicycle accident. If you are a fan of gorgeous scenery and secluded safety, explore the cycling trails of Mission Trails Regional Park. One of the best options for mountain biking in this city, this park has nearly 6,000 acres of trails you can explore without fear of motorist collisions. The park is only a few miles from San Diego’s Mission Valley District, but you will feel miles from civilization. Enjoy desert views and safe, uninterrupted rides in this regional park. This stretch of road is a very popular spot in San Diego for both cyclists and drivers, since it expands two major areas of the city: Hillcrest to City Heights. Although it is a direct route, this stretch of University Avenue is very prone to collisions and can be hazardous to cyclists. The route contains a number of major intersections that cyclists have to navigate alongside motorists. Both parked and moving motorists pose a hazard to cyclists along this avenue. If you are looking for scenic views of the San Diego Skyline, travel to Mission Beach and ride the trail along Mission and Sail Bay. The trail runs parallel to the Pacific Beach Boardwalk, making it another safe place to spend your day cycling. Enjoy the water and natural scenery while traversing this area. Since it is not usually as busy as Pacific Beach, you can enjoy a calmer, safer ride. While Friars Road is a recommended bike route in San Diego, it is not the safest place to cycle in this area. Anywhere near a freeway on-ramp and merging cars can pose a hazard to cyclists, especially at this intersection. The designated bike lanes do not make it a safe place for cyclists; you will have to weave through multiple lanes of cars trying to merge on the freeway, putting yourself at risk for collision. Stay safe while you are riding your bike in San Diego. Always wear a helmet and stay alert regarding your surroundings. Make sure to ride on bike lanes and other designated areas. 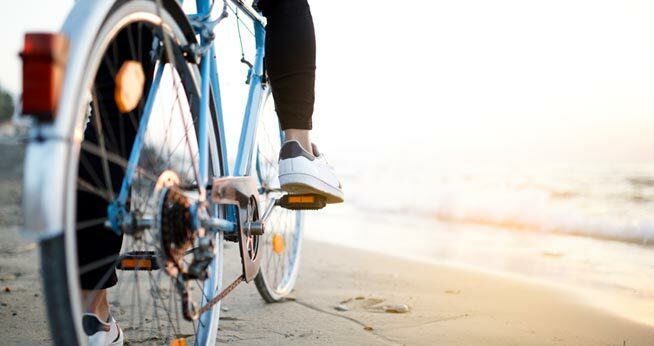 If you are involved in a motor vehicle collision while riding your bike in the city, seek medical attention and contact a bicycle accident attorney as soon as possible.